The pomegranate, has been celebrated as a symbol of ambition and prosperity since Ancient Egyptian times. In fact, it seems that pretty much every ancient culture all over the world has drawn, praised and written about it throughout the ages. 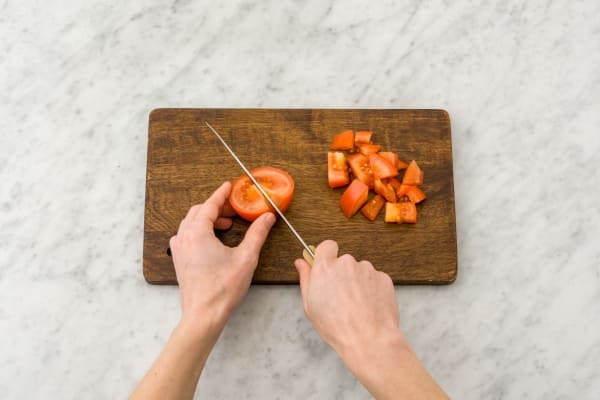 For tonight’s dinner you’ll be taking the bold step of cooking with it and we’re sure you’ll be making your own little piece of dinner time history. Bring 250ml of water to the boil and grate the zest of half your lemon. 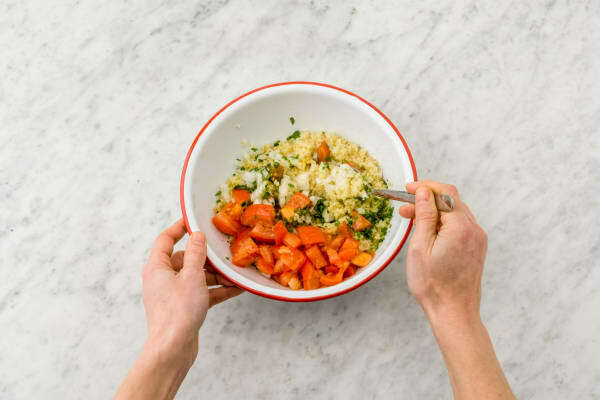 Pour the bulgur wheat into the boiling water and add the zest and ¼ tsp of salt. Place a lid on the pot and rest off the heat for 25 mins, or until the water has completely soaked into the wheat. 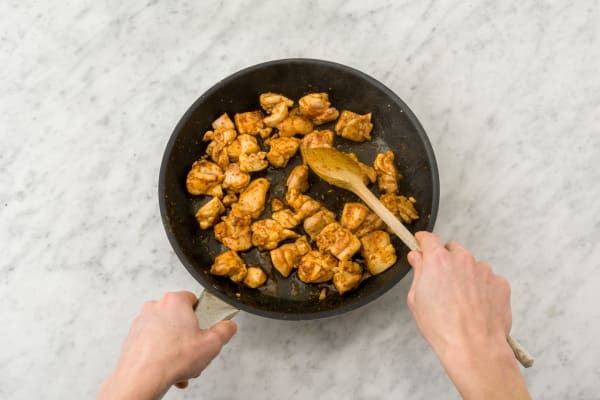 Chop the chicken into small, bite-sized pieces. Mix the chicken with the harissa. Peel and finely chop half the onion and roughly chop the parsley. Cut the tomatoes in half and roughly chop into 11/2cm pieces. Mix the yoghurt with 1 tbsp of lemon juice and a pinch of salt and pepper. Heat a frying pan on medium high heat and add 1 tbsp of olive oil. Fry off the chicken for around 5 mins or until it is no longer pink in the middle. Once ready add 1 tbsp of olive oil and 1 tbsp of lemon juice to the bulgur wheat. Mix in the onion, tomato and two-thirds of the parsley. 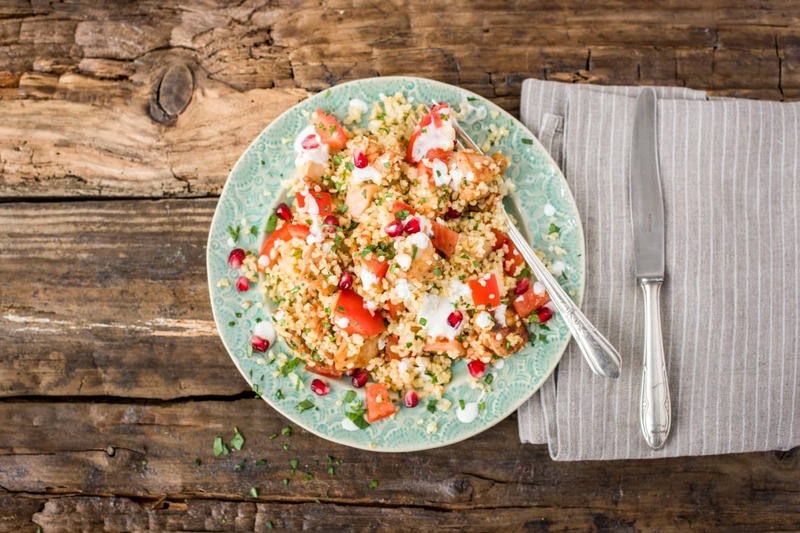 Serve the chicken mixed into the bulgur wheat salad and sprinkle the pomegranate seeds over the top with the remaining parsley. Drizzle with the yoghurt and fill your boots!